This recipe is from mia mamma. I was actually able to make two dishes of this and it lasted the hubs and I three days. The picture of the entire dish is actually from day 3, so you can see how well it holds up. This is an ambitious meal for my kitchenette and I definitely trashed my kitchen making this. However, if you have the time, energy, and possibly space you should definitely make this. At the very least it will get you a night of leftovers so to me it’s worth the investment. Could be fun for a middle-schooler to assist with dipping the eggplant and placing them on the pan. First chop up about 1/4 or 1/2 an onion into small pieces. Cook this in some olive oil. Add a clove of crushed garlic (garlic press). After the onion and garlic have softened a bit add the 2 cans of sauce. Stir and let simmer on low while you take care of the eggplant (By the way… has anyone figured out the perfect way to simmer sauce without little drops popping and flying everywhere?? I turn it on the lowest setting and it still makes a mess on my stove). In a large bowl beat the eggs well and add the flour, salt, pepper, cheese, and water until you get a thin batter. I added a good amount of water and kept mixing until it was nice and runny. 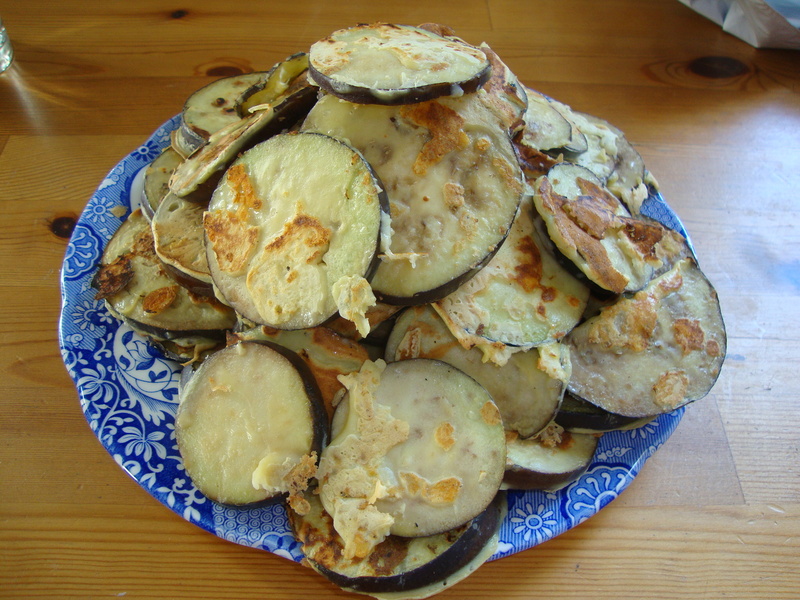 Dip the eggplant and fry until golden brown on both sides. I actually had 2 pans going on the stove top to speed things up. Things got a little crazy. Smoke detectors may have gone off. I might also have been on the phone with my bf. Mayhem. Put on a plate and set aside. Put a layer of the sauce in the bottom of a large glass baking dish (I ended up using 1 glass casserole dish plus a glass pie dish). 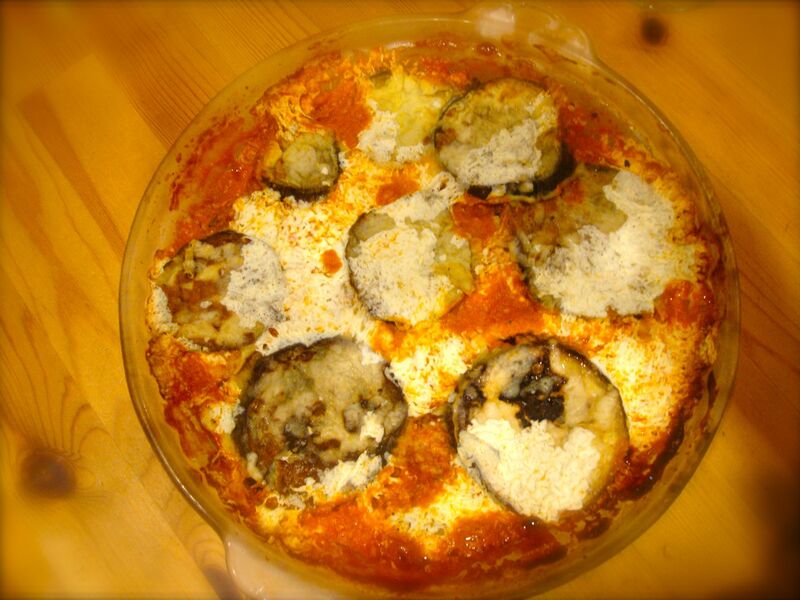 Then put a few layers of eggplant, a layer of grated parmesan, mozzarella cheese and then sauce. Repeat and end with a layer of cheese. Bake at 350 degrees for about 45 minutes covered with foil. Then remove the foil and cook another 10 minutes. What I like about this dish is it fulfills my need for pasta without me actually eating any pasta.